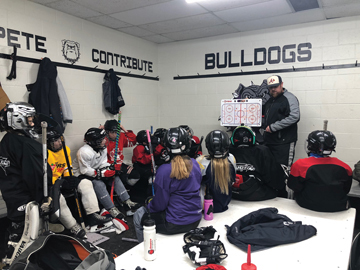 Photo Submitted by Cam Church IMPROVING PLAYERS: Irvine Bulldogs atom B head coach Cam Chruch draws out a drill for his team last week. Cam Church has been coaching at the younger levels of the Irvine Minor Hockey system for five-years and for his dedication to improving players on the ice, he was the recipient of the Hockey Alberta Coach of the Month for December, which was awarded to him in early January. The award goes out monthly between October and March to those coaches who are nominated by parents or groups within a team for their hard work. “I was surprised,” said Church. He has three hockey playing kids in Irvine and is an assistant coach with initiation senior Bulldogs, the novice majors and is head coach for the Atom B team. “The priority is to have fun,” he said. “You want them (the kids) to come to the rink. At that younger level, to get the kids involved, it’s not always about the game itself. A lot of times, you do certain activities on the ice that has nothing to do with hockey. When players climb up to the atom level, you want to teach them the principles of attitude, focus respect and hand work, he added. Like any other rural Canadian town, Irvine has a passion for hockey and the atmosphere makes coming to rink and coaching a memorable experience. “As soon as you walk through those doors, the rink staff are friendly, everybody knows everybody,” he said. His goal will be to continue coaching as long as the kids are enjoying the game.